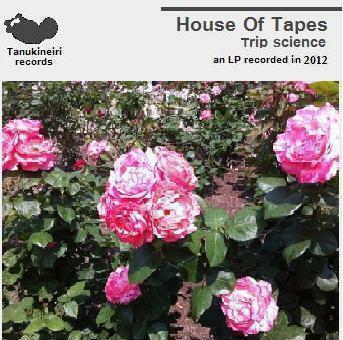 That Nagoya’s House Of Tapes’ debut album Trip Science is an enjoyable experience at all is a small miracle. That sounds harsh, the darkest shade one could throw, but I don’t mean that in a dismissive or ironically surprised way. House Of Tapes’ music has always sounded like a sonic endurance test, the dance-music equivalent of being forced to watch every Gasper Noe film in succession. He’s always categorized his music as “house,” but that has always ben too simple a description. This music is heavy, blasted-out stuff that often sounds crushing. Yet Trip Science works as an album, mostly because of how committed to his often pummeling sound Hose Of Tapes is. It’s not entirely a heavy affair – bell chimes pop up on “Chaos Tape” while late track “Faint Light” is the one moment on the album where House Of Tapes opens the shades a bit – but the bulk of this release focuses on hard-hitting beats and electronics that sound like they are being sucked into a black hole. Previously released songs like “Starting Point” and the appropriately titled “Noise Attack” still carry the same impact they did when they appeared last year, but now sit comfortably within Trip Science’s frame. This is challenging stuff, but not a challenge to listen to. Get it here.